This beautiful brooch features a renaissance scroll design and blue Austrian Crystal center. 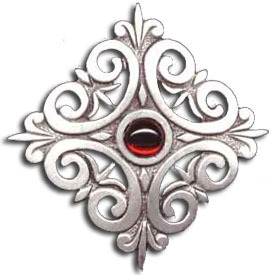 The pin measures 1.5" square and is cast from lead free pewter. The back features a solid brass joint and catch pin to ensure the brooch will stay in position.